As I mentioned, cannelloni is quite similar to enchiladas. For this recipe, rather than buying those hard, dried cannelloni pasta shells (which are difficult to fill), I used flat, no-cook lasagna noodles. The noodles are soaked in hot water until pliable, then filled and rolled. As for the filling, this recipe combined crumbled Italian sausage and mushrooms with a creamy 3 cheese mixture. Once you've filled a baking dish with cannelloni, everything is topped with more sauce and cheese. It's all baked to a bubbly finish and garnished with more cheese and fresh parsley. Sauté the garlic, onion, and mushrooms in the olive oil over medium heat until onions and mushrooms begin to turn color. Add the sausage and crumble into the pan. Continue to cook until sausage is browned. Add the wine or vermouth and turn up the heat, stirring often until all the wine is absorbed and onions are golden. Remove to a plate to cool. Combine the ricotta, cubed cheese, 2 tbsp Parmesan, parsley and pepper in a medium bowl. Add the sausage and mushroom mixture to cheese mixture. Fill a 13 x 9 x 2" glass baking dish with 1" very hot water, and immerse the uncooked lasagna noodles in the water, making sure to keep them separate. Allow to soak about 5 minutes, until pliable enough to be rolled. Lay them out flat on a tea towel. Lightly brush bottom of baking dish with olive oil and spread about 3/4 cup of sauce in it. Spread about 2 ounces (scant 1/3 cup) of the filling on lower two-thirds of each noodle, and roll up from the short side. Lay in the baking pan seam side down. All 16 should fit perfectly. Cover completely with most of the remaining sauce (about 1-1/2 28-ounce containers) and sprinkle top with remaining 3/4 cup grated cheese. Cover with foil and bake at 375 about 40 minutes. Uncover, raise oven temperature to 425, and bake a few minutes longer until cheese on top is just golden. Let rest about 5 minutes and serve. Note: The cheese filling can be made a day ahead and kept refrigerated. This does look extremely comforting and delicious. 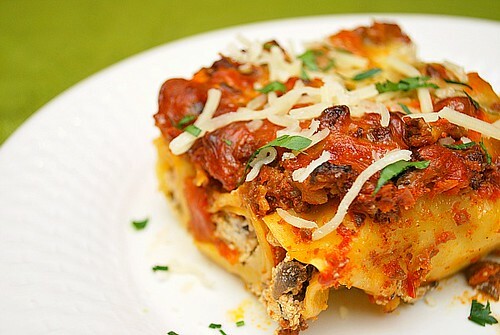 It is absolutely making me crave a baked pasta dish! I am so glad that you are living your dream. Congratulations. Joel looks like a little man. Adorable.